Police intervene to try and defuse the situation. Police had to intervene as some Wolves fans in a box goaded Bolton supporters during a 0-4 trouncing that clinched the Championship title for Nuno Espírito Santo’s side. 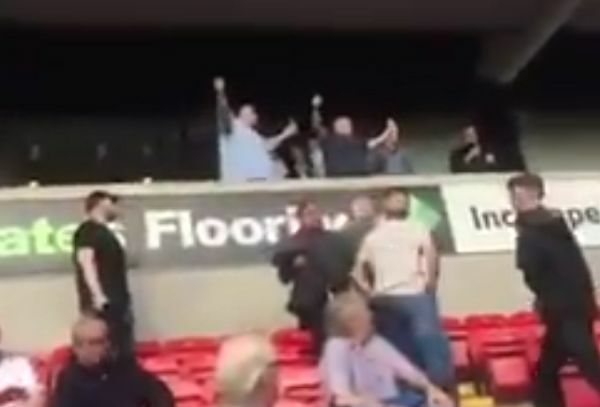 Goals apiece from Barry Douglas, Benik Afobe, Diogo Jota and Conor Coady gave Wolves a thumping victory at the relegation-threatened Trotters – and these supporters just couldn’t hide their delight. They sing victoriously from a box overlooking a section of disgruntled home fans, who respond with a barrage of abuse and makeshift missiles. Eventually a group of police swarm in to try and defuse the situation, with tensions clearly running high.